Quick Quotes is very excited to participate in the 2017 Fall Coffee Lovers Blog Hop! The fall edition of the wildly popular Coffee Lover's Blog Hop is kicking off today. Quick Quotes is a super sponsor for this hop and if you play along you have a chance to win a $25 Online Gift Certificate*. We invite you to stop on back to our blog here as we will have several Fall Coffee projects to share with you in the next several days as we celebrate the love of Fall and Coffee! Hello and welcome! Susie hosting the blog today and I am so very happy to help us kick off the Fall Coffee Lover's Blog Hop! 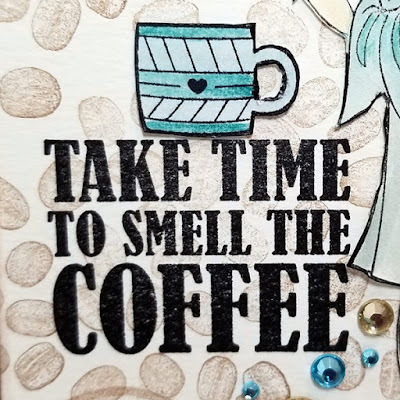 I am sharing a card that features some wonderful "coffee inspired" PowderPuff Chalking Ink colors! 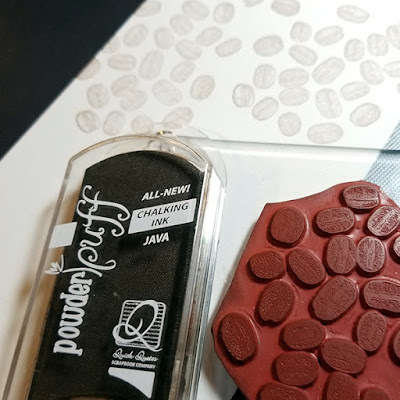 I started by stamping a coffee bean background using Java. I stamped a doll image on watercolor paper with archival black ink. 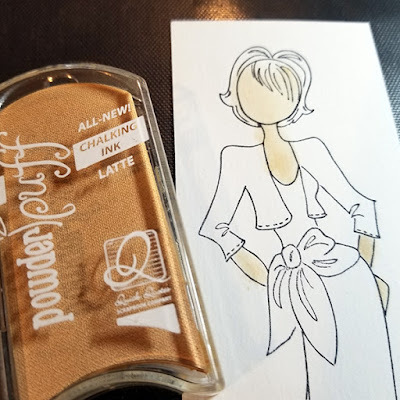 I then chose Latte PowderPuff Chalking Ink to provide the skin tone on my stamped image. 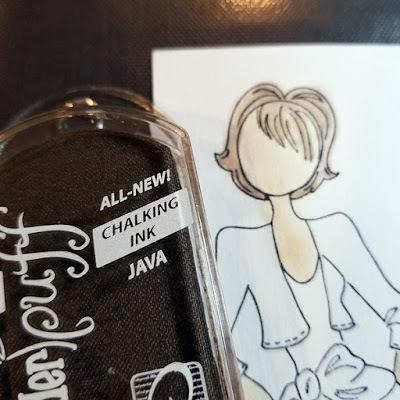 I stamped the ink onto my craft mat, spritzed on some water and used a paintbrush to watercolor the image. In the same manner, I water colored the hair with Java. The jacket was colored with Bora Bora and the dress was colored with Slate. I stamped the sentiment in black ink and then added the coffee mug, colored with Bora Bora, on top. 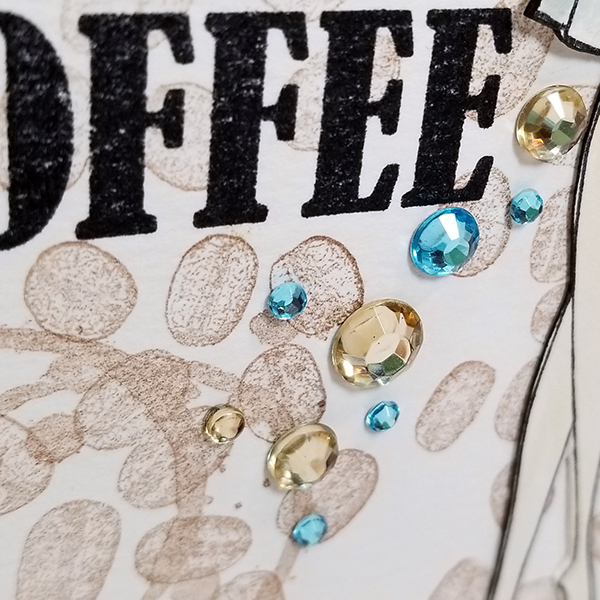 The finishing touch was the sprinkling of blue and brown rhinestones. Thanks for stopping by and I hope you find some time to play! Susie, your card is amazing! Love your color choices! So elegant. We are so thrilled to have Quick Quotes as a NEW Super Sponsor!!!!! Gorgeous card - love the background and she's so stylin'!!!! Thanks for being a super sponsor! Thanks for being a wonderful sponsor. I love the doll image - she's a beauty! And love the colors you used to color her as well. Thanks so much for sponsoring the CLBH! This is super cute and very creative. Thanks for the sponsorship support. Lovely Prima Doll card. Thanks for being a SS. Thanks for being a Super sponsor!! Your card is beautiful, I always underestimate what chalk inks can do! Love the long, tall format of this card and the fun background!! Great background and colouring! Love the lovely long shape of this card too. Thanks for being a super sponsor! Love how you made your background! Love the soft look of the BG with this cute Prima doll image, love it totally! Thanks for being a super sponsor! This is gorgeous! Love the color choices-perfect! Thank You for Sponsoring the hop! What a great card! Love it! Welcome to the hop and thanks so much for being a sponsor! Pretty card! Thanks so much for sponsoring the Fall CLBH! So beautiful and elegant! Thanks for sharing and for sponsoring the hop. I love the colors and the rhinestones are a nice touch. Thanks for being a sponsor. 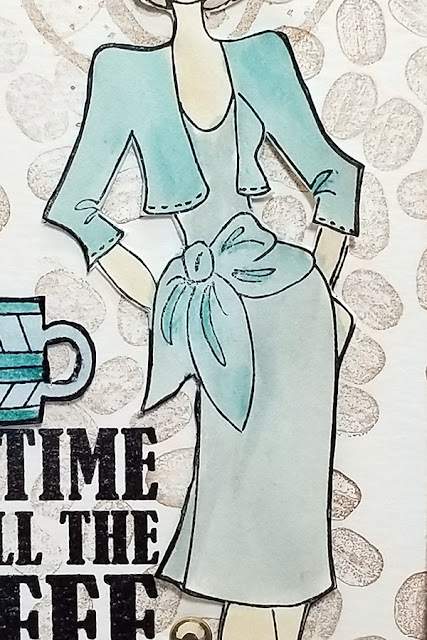 Great card design and wonderful coloring of that sassy lady! This is a great card! I love the strong, beautiful woman! Thanks fo being a super sponsor! What an amazing card! Thank you for sponsoring our hop! Thank you fro being a sponsor on the Fall coffee blog hop. Oh I love this card a latte! Totally adorable with the image, sentiment and gems. I love the background. I need a coffee before I continue with the hop. Such a pretty card. Love the blue with the coffee color. Beautiful card! Thanks for being a super sponsor!!! I love your card and how its watercolored. Fun coffee themed card. Thanks for sponsoring the hop! Oh I love your lovely card, so classy! Thanks for being a Super Sponsor! Love the way you made this card. 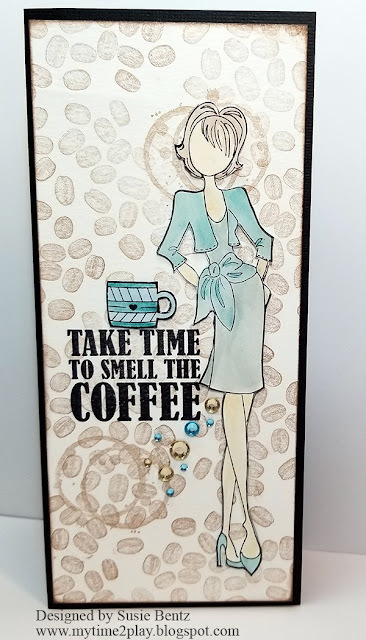 Pleasant coffee bean background and bold sentiment and prima doll.together a great card.thank you for being super sponzor for Coffee lovers blog hop! wow, this is a fancy looking card! Love that sentiment, and bling, matching the colors of the whole theme of the card! Thanks for being SS! Love your colouring technique and minimal colour pallet. Absolutely fabulous design. Loving that Java stamp also! wow - wonderful card - love how you watercolored that image! Thanks for being a super sponsor! Very pretty with the soft colors. thanks for being a sponsor.